Soft, gooey chocolate chip cookies are one of my guilty pleasures, and a couple years ago, I set out on a mission to find the world’s best, most foolproof chocolate chip cookie recipe. After trying out countless recipes that produced cookies that were too crunchy or too flat, I knew I had to find a recipe that made soft, chewy cookies every time. I tried the recipes on the Tollhouse and Ghirardelli chocolate chip bags. The verdict? Delicious, but still too flat. After quite a few other recipe trials, I happened to find this recipe. It was almost too simple, but I knew it was the winner as soon as the cookies came out of the oven. They were the softest, gooiest, most perfect chocolate chip cookies I’d made, and the recipe was the easiest one by far. Go figure! Since then, I’ve made them no less than a dozen times. The recipe calls for melted butter, which is wonderful so you don’t have to wait for a stick of butter to soften for a few hours at room temperature. You don’t even need to refrigerate the dough before making the cookies. And my favorite part of all is that you just need a bowl and a spoon– no mixer! Starting from the time you pull the ingredients out of the pantry to when you take the cookies out of the oven, they can be ready in 20-30 minutes. Enjoy! Perfectly soft and chewy chocolate chip cookies– no mixer needed! In a large bowl, stir the melted butter and sugars until they are combined. Add the egg, egg yolk, and vanilla and stir until mixed. Add baking soda, salt, optional espresso powder, and flour and mix until a dough is almost formed. Mix in 1 1/2 cups chocolate chips until the dough is just combined. If desired, cover the dough and refrigerate for up to 24 hours, until you're ready to bake them. Divide the dough how you choose (1/4 cup portions for 18 large cookies or 2 tablespoon portions for 36 smaller cookies). If you’re making large cookies, leave about 2 inches in between each. Use the remaining 1/2 cup of chocolate chips to press extra chocolate chips into the tops of each cookie dough ball. Bake at 325 degrees for 13-15 minutes (large cookies) or 10-12 minutes (small cookies) until the cookies are just set and barely browned. The centers should be soft and a little puffy. Do not over bake. Let sit for 3-5 minutes before removing to a cooling rack. Leftover cookies can be stored at room temperature for up to 3 days or frozen for up to 6 month in a storage container or ziplock bag. 12 tablespoons of butter is equal to 1 1/2 standard sticks of butter. These look AMAZING. I want them all! My Mom and I have been on the hunt for the perfect chocolate chip cookie for years. We want soft, chewy and fluffy. Sounds like you have found it. Cannot wait to try these. Yesss, so glad it’s not just me who’s determined to make the best chocolate chip cookie! This really is the perfect recipe 🙂 You’ll have to let me know how it goes! YES! I think chocolate chip cookies are underrated. They’re so simple, but SO good! You can never go wrong with the classics! 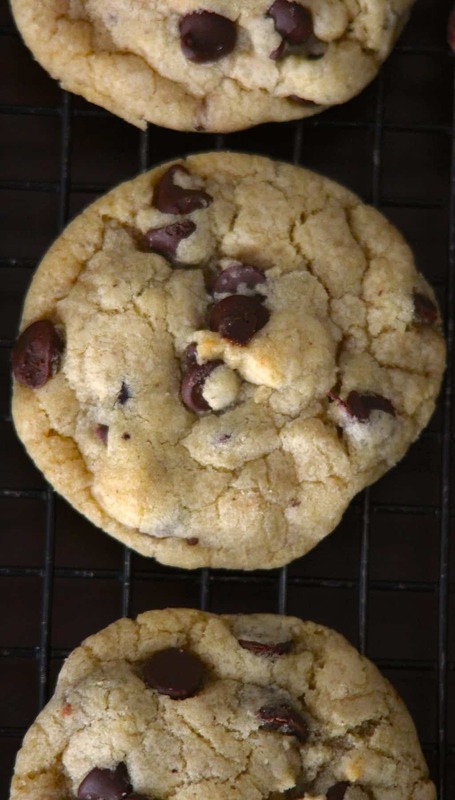 I am always trying new chocolate chip cookie recipes and these look delicious! These definitely remind me of those soft, bakery-style cookies! My favorite brownie recipe uses espresso powder, too, and it’s such a great addition. Your mom’s frosting sounds so good! I love coffee and chocolate together. I love that you tried so many recipes before deciding on the best one! When it comes to chocolate chip cookies, you can’t mess around, hardly anything beats a really good one!! These are seriously the BEST cookies ever. My fiance loves them and so do I! So glad to hear it, Maggie! Thanks for the feedback! Thanks for the feedback, Linda! I’ll add a note to the recipe saying that 12 tablespoons is equal to 3/4 cup butter. Hope you love the cookies! I am currently dancing around in front of the oven. So super glad I found this you genius of a woman! So glad to hear that you enjoyed the cookies, Terri!!! They’re my favorite, as well! I do not bake, and I have never commented on a recipe before, but I just made these cookies and they are scrumptious! Just made these, for once they turned out as expected, and look like the picture! I been making Tollhouse and for whatever reason the past couple years they were coming out flat! So I started looking for a new recipe. This is it! YES! 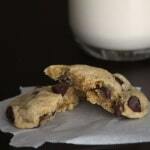 I’m so glad this recipe can be your new go-to chocolate chip cookie recipe! I love having a few of those tried-and-true recipes in my arsenal that I know will turn out every time. This is VERY similar to the recipe my family loves. I brown the butter(it gives it an awesome toffee flavor) but melted will work also. The major difference is that once I add the sugars I wait until the sugar is melted and then add the eggs and vanilla. Then whisk for 30 seconds and rest for 3 minutes. Do that 2 more times. You basically end up with what looks like a thin caramel and then you add in the flour mixture. It takes a little longer but the taste difference is AMAZING. Wow, that sounds amazing! I bet it’d take these cookies over the top. I’m definitely going to give your technique a try the next time I make them! I made these cookies today and they are so good; soft, thick, and slightly crispy on the edges. Thanks for the great recipe. I’m so glad to hear that you enjoyed this chocolate chip cookie recipe, Joanna!! Thanks for reporting back! I just made these along with a meal to take to a family where the mother is very ill. There are three teenagers, and I thought they would love these Well, I can tell you…I love them!!! These are the best and easiest chocolate chip cookies I have ever made (75 years old…been cooking a long time! I’m so happy to hear you enjoyed these chocolate chip cookies, Ms. Eva! I’m sure your delicious meal brightened the family’s day! Just made these cookies and they are truly a soft, delicious cookie! I used Coconut oil rather than butter and melted it as instructed. Thank you for sharing your recipe; it will definitely be pinned to my dessert board!! Great to know that coconut oil works instead of butter in these cookies! I’ll have to keep that in mind. So glad you enjoyed the cookies and thanks so much for sharing, Kay! So glad to hear you enjoyed these cookies! I use light brown sugar but I believe you could use either with great results. A question. I made these as posted but would like to know if you chill the recipe first before you cook. Also do you flatten them out. I did put the chips on top of ball but didn’t flatten them out. I don’t know if any of this would make a difference but thought I would ask. I chill this dough sometimes before baking them but haven’t found it to make a huge difference, besides making it a bit easier to roll the dough into balls. No need to flatten them out! Thank you . Your cookie recipe was a great hit!! I took them to my nephews Birthday Party and they disappeared fast. Some adults were trying to save a few for themselves for later. Great cookies!! I’m so glad you enjoyed these, Madison! 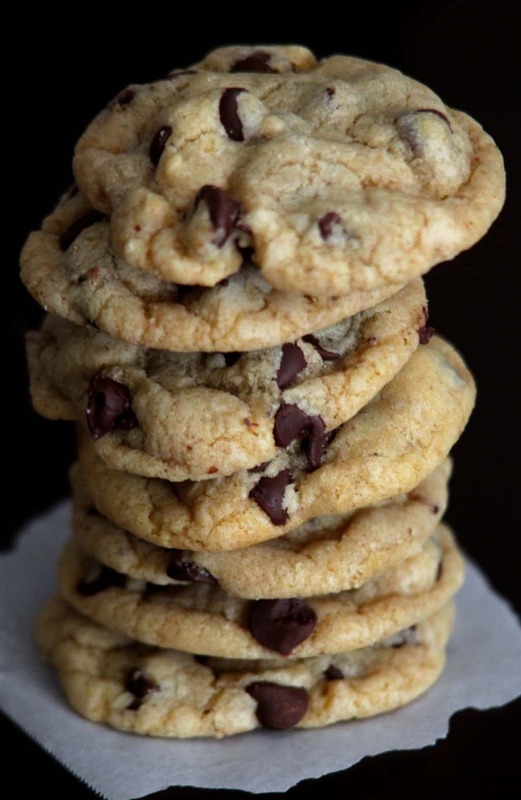 These are my all-time favorite chocolate chip cookies- I may never even test another recipe! 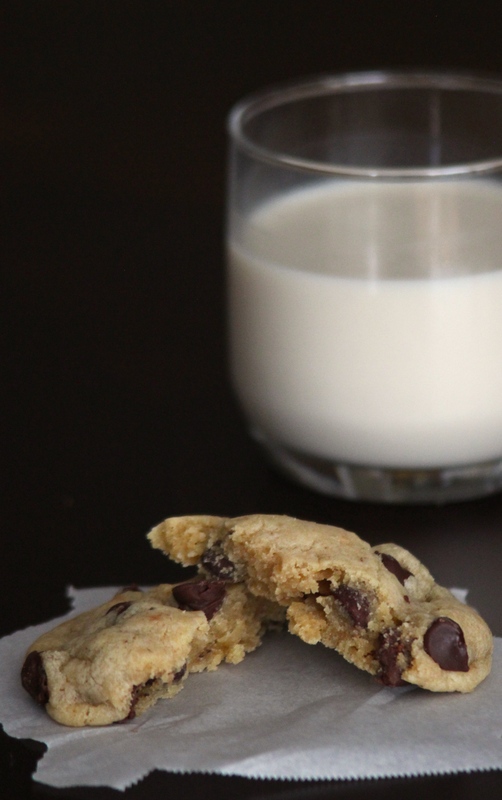 These are the BEST homemade chocolate chip cookies we’ve ever made/eaten! They are incredibly easy to bake, very soft and extremely flavorful. We were out of unsalted butter so we omitted the 1/2 teaspoon salt-perfection! This recipe is a must for any occasion. Thank you for making our family’s tastebuds very happy! Awesome, I’m so glad to hear how much your family enjoyed these cookies! Finally found my brand new go to recipe thanks to you. These were absolutely perfect and even my family loved them more than a certain doughboy brand dough that they insisted on until now. One more thing on my list of homemade instead of store bought which I am very pleased about. I’m so glad you and your family loved these cookies, Sharon! They’re my go-to, as well! I love to try new cookie recipes. These turned out soft and fluffy with a good taste, the only drawback is that I like my cookies a little darker. Good and easy recipe, I’ll make them again. Should I just leave the cookies rolled in a ball or should I press it flat? Delicious.crunchy on the edges chewy in the middle. I baked some for a few more minutes to get them crunchy throughout. Can I cut back a little of the sugar? How drastic will recipe change? Can I use cocoa powder in place of the expresso powder? I want to try these and don’t have expresso powder. I haven’t tried cocoa powder, but I’d recommend just omitting the espresso powder! It just adds a little something extra, but they’re wonderful without it, as well! Hi! I’m 11 years old and I’m trying to learn how to bake. I’m starting to get the hang of it and my family legit went through 3 batches of these in a bit more than a week (Guilty) Thanks so much. This is first recipe I’ve made that hasn’t completely failed. This just shows me that there is hope for my awful baking to get better.